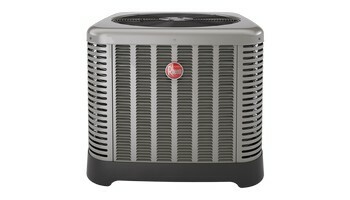 The Rheem Prestige Series High Efficiency Two-Stage RASL-JEC Condensing Unit was designed with performance in mind. These units offer comfort, energy conservation and dependability for single, multi-family and light commercial applications. The Rheem Prestige Series Two-Stage RASL- JEC Condensing Units are the result of an ongoing development program for improved efficiencies. With system SEER's as high as 19.5, these units continue a tradition of delivering high efficiency., Outdoor air conditioner designed for ground level or rooftop installations. These units offer comfort and dependability for single, multi-family and light commercial applications. Painted louvered steel cabinet • Easily accessible control box,Condenser coils constructed with copper tubing and enhanced aluminum fins.,Industry’s lowest profile design: 33″ maximum height.,The Comfort Control2 System provides over 37+ on-board diagnostics and fault history codes for condensing units with single-phase compressors. Offers auto-configuration, and diagnostic messaging with full communicating capability when installed with a Serial Communicating Air Handler and user interface control Series 500 thermostat.,Unit can be conventionally wired with non-communicating air-handlers or furnaces with non-communicating thermostat.For for precise temperature control and On-Demand dehumidification .Reduces the level of humidity in the air, usually for health reasons. Humid air can cause mold and mildew to grow inside homes, which pose various health risks. (may need additional components) Powder painted for all-weather protection.Steel reinforced for extra strength.Attractive, louvered wrap-around jacket protects the coil from yard hazards and weather extremes.For quiet operation and improved efficiency.All models meet or exceed a 1000-hour salt spray test per ASTM B117 Standard Practice for Operating Salt Spray Testing Apparatus.Earth-friendly R-410A,, We consider the work that goes into installing and servicing our products, as well as how we can deliver the very best homeowner experience. And then we take it a step further. That’s 360°+1. And that’s why you can count on your Rheem Air Conditioning unit to bring you and your family years of comfort . Eco Net is smart new technology developed exclusively by Rheem that allows Rheem Heating, Cooling and Water Heating products to communicate with each other on one integrated network .A smart, efficient design makes the Eco Net Enabled Rheem Classic Plus Series Two-Stage Air Conditioner one of your best options for staying cool inside. Each new unit includes a generous list of features that work together to bring you quiet, efficient and reliable indoor comfort. 2 Two-Stage Copeland Scroll UltraTech compressor makes the Classic Plus Series as efficient as it is durable, A Single-Stage unit runs at one speed, but the Two-Stage RA17 modulates between two speeds – high and medium. It will operate on medium speed most of the time, providing more precise temperatures and lower humidity while also reducing energy use. The system only operates on high when necessary during peak, warm weather conditions.